As the warmer weather arrives, our food preferences change. Who wants to turn on the oven? Salads, sandwiches and only using a burner at times becomes very appealing. How about a yummy BLT with a garden fresh tomato, or some shrimp and penne with fresh basil. Cucumbers from the garden in a green salad, or even just sliced with a bit of lime on them, can keep us cool. In the winter, visiting a farmer’s market is nice, but summertime can mean having sun-ripened veggies right from the backyard or patio. I am always checking out new ways to produce my own veggies, and this year I found just the right thing! Miracle -Gro has a great new product; they introduced Gro-ables seed pods. They are easy to use, even for a beginner. You not only get easy to follow instructions, they even come with a money back guarantee as long as you follow the simple instructions and keep a proof of purchase. Target has them right now for $1.25 each. I started with tomato, basil and cucumber. If you have your soil prepared outside and you are sure there will be no more freezes, you can plant them simply by placing the whole little pod in the soil. Then it is just a matter of keeping them moist. The directions make it very clear on how far apart and how many of each, depending on what you decide to plant. and you can get more support at Sprout It to help you plan it all out. Because I have a sunny spot inside, and I am not confident we won’t have a random late freeze, I followed the simple instructions to start indoors and I will transplant in a couple of weeks after I have prepared the outdoor soil. I will definitely do a follow up on that event. 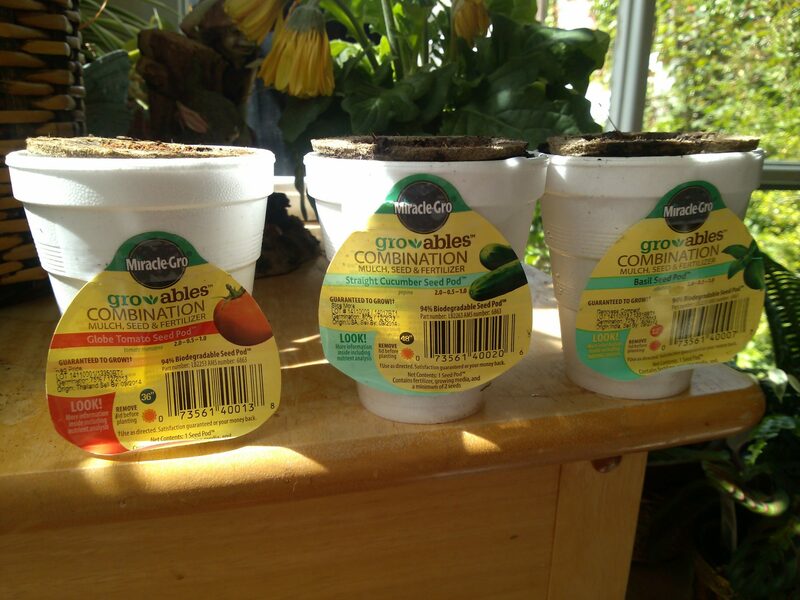 I used some styrofoam cups filled loosely with some Miracle-Gro Organic Choice garden soil for each of my pods. It will be easy to keep an eye on them until I move them outside. I labeled each one with the lid that I removed from the top. When transplanting time arrives, they will be easy to slip out. These neat little pods take the guesswork out of starting your own plants, and it saves some money at the beginning, and even more when you get to harvest. You know this if you have done your own gardening before, but if you have not, you really should give these a try. I am excited to go get some more for myself, and to give you the details as it all progresses. That fresh basil will be so good on pasta and veggies. I love a sun-ripened tomato on a homemade BLTA (A=Avocado), or combined with a crisp cucumber in a fresh summer salad. 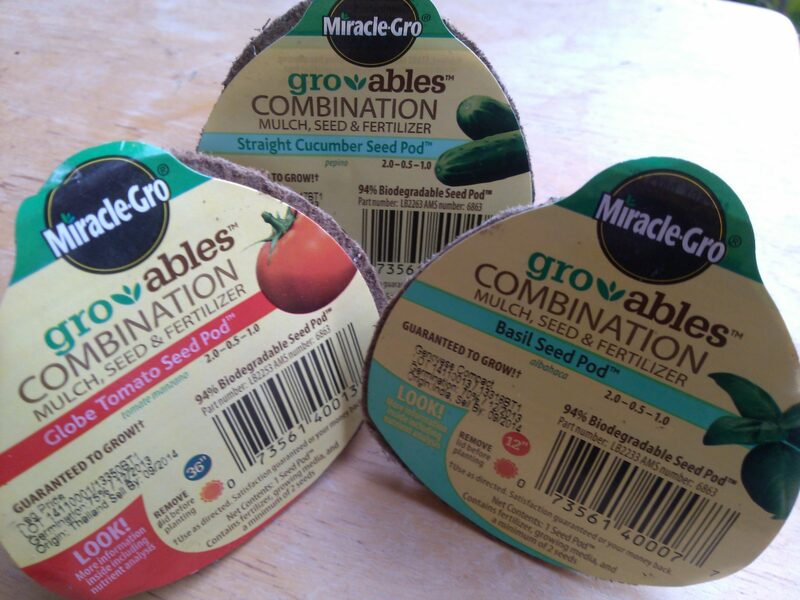 I hope you all join in this gardening adventure with your own Miracle-Gro Seed Pods. I would love to hear what recipes you have planned with your choices. Check out the Gro-ables videos below!